The Career Center issues a WASEDA Job Guidebook (Japanese) to all students seeking employment. It covers all the major job-hunting practices. A simplified version in English is also available to our English-speaking students. If you are one of the many new career seekers, do grab hold of one. A “Design Your Future” Handbook (Japanese) is also distributed to all freshmen, and students who are interested to learn more about the facilities in WASEDA University. A simplified English version is also available upon request. Once you begin your job-hunting exercise, please register your Career Options on MyWASEDA. Bound by the Employment Stability regulations, all job-hunting students are required to complete the above-mentioned document. Failing to do so, some recruitment notices may fail to reach you. Available in Japanese and English, this service aims to provide our international students and bilingual career seekers with information and schedules of recruitment exercises, internships, development workshops and career fairs. It is issued twice a month (excluding summer and winter recesses). If you are interested, please email us at: career@list.waseda.jp with your name and student ID number. Please indicate clearly in the topic, “Subscription to E-Newsletter for International Students”. All messages will be directed to your Waseda email account. In addition, the Career Center also provides “Career Center Kawaraban (E-Newsletter in Japanese) to all job-hunting WASEDA University students. You are encouraged to subscribe to the service as well. The Career Center organizes many recruitment talks and seminars for our students. In March, about 500 companies will be invited to take part in our recruitment talks on campus. More recruitment talks are expected to take place between June – July, and October ^ November. Career advisory service, guidance, seminars, and career talks are also being arranged specifically for international students. Most of the events are conducted in Japanese, but you will find guidance and seminars in English as well. Should you miss those events, you can view some of them on the “Course N@vi”. There are many reference materials available at the Career Center. Do pay us a visit! A large number of corporations will send their recruitment-drive notices to WASEDA University. Simply search by using the “Career Compass” on MyWASEDA. International students can also access a list of companies that are actively looking for foreign graduates. Please click this link for details. Businesses that do not clearly indicate “International Student Recruitment” may also recruit international graduates. Corporations are looking for talented and competent persons regardless of their nationality. Most companies do not make a clear distinction between “Japanese” and “International Students”. Visit us at the Career Center, and you will find information on talks and seminars for international students. 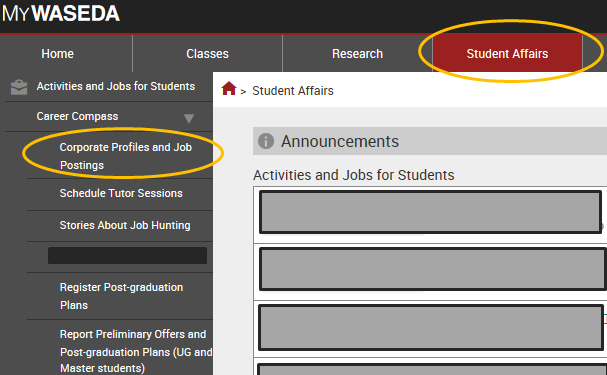 If you wish to search internship and recruitment information in English, please access MyWaseda→Student Affairs→Career Resources and please click this link for the detailed procedures. Career Resources include recruitment information of global companies in the world. Please have a look! Once you have accepted an employment (job) offer, or plan to further your studies, or remain undecided even upon graduation, please update your graduation record on MyWASEDA before you graduate. To learn more about the updating process, please refer to the Career Compass (Career Path Determination Report). Full-time students who have received official job offers, the Career Center would also greatly appreciate if you could share your job-hunting experiences when you update your graduation records. We may also invite you to join us in some of our seminars, to speak directly with new job-seekers.